In pharmaceutical operations, it is crucial that process reliability is always high and consistent. Central to this aim is timely measurement of analytical parameters. Although analysis of grab samples offers accurate results, it is time-consuming, carries the possibility of sample contamination, and does not supply continuous, real-time data. On the other hand, in-line measurement using process analytical equipment reduces the workload of laboratory staff; measures directly in the process, eliminating the possibility of false readings due to contamination; and supplies a constant stream of real-time measurements, allowing rapid corrective action when necessary. Most significantly, in-line analytical measurements enable reliable, repeatable production of high quality pharmaceutical products, batch after batch. 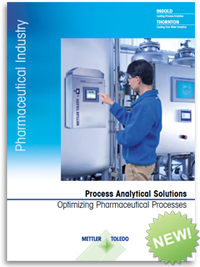 This eBooklet highlights different analytical measurement challenges during biopharmaceutical fermentation and explains the value of implementing in-line process analytical equipment to enable reliable, repeatable production of high quality pharmaceutical products, batch after batch. Several critical processes are outlined in case studies, in which solutions and their implementation are detailed. Production processes and Purified Water quality can be assured through monitoring analytical parameters. 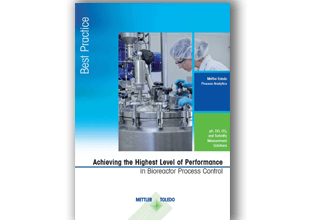 For every stage of the manufacture of pharmaceuticals, METTLER TOLEDO in-line measurement systems deliver accurate, real-time evaluation of process conditions. Pharmaceutical waters are a multi-functional resource, crossing all disciplines in the pharmaceutical industry. Water is used as a raw material, solvent, ingredient, reagent, and cleaning agent, and is produced in a variety of “pure” forms. 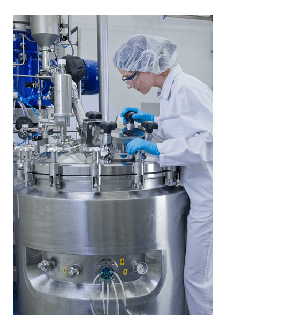 The wide variety of pharmaceutical waters and water systems means their production is becoming an increasingly specialized process that requires highly dependable instrumentation. For continuous assurance of water quality, on-line measurement of TOC, ORP and conductivity is essential. Inoculums are pure cultures of microorganisms used for fermentation processes. The size and the quality of the starter cultures is very important to keep fermentation processes sustainable. pH and DO measurement is essential for optimal starter culture growth conditions. pH affects the activity of enzymes and DO control ensures adequate supply of oxygen for respiration. Media is used in biopharmaceutical operations to promote bacteria growth. Growth conditions are heavily dependent on pH, and by properly adjusting pH in the media, cost savings can be achieved through decreased acid/alkaline dosage during inoculum and production fermentations. During fermentation processes, data from analytical measurement systems enables the maintenance of consistent living conditions for the production of microorganisms or suspended cells. Important parameters for monitoring the physiochemical environment are pH, dissolved oxygen, dissolved carbon dioxide, and turbidity. Control of these four parameters leads to maximized process yield, batch to batch consistency, reduced product loss and quicker batch runs. It also ensures that optimal growth conditions are constantly met. Separation processes are critical steps in the production of biological products, as they directly affect product consistency and yield. Separating the cells is generally carried out by centrifugation or filtration. Controlling separation by turbidity based on loading, leads to greater efficiency and productivity from the filtration process. Buffers are liquids usually consisting of water, salts and pH adjusting chemicals. They are used as a liquid phase in chromatography, dialysis and other processes. Correct pH is essential for buffer accuracy to ensure high resolution purification and increased reproducibility. Chromatography plays an important role in the purification of pharmaceutical products derived from biotechnology processes. It isolates and purifies the product of interest. Maintaining precise pH and conductivity levels is critical in liquid chromatography. This application note explains the temperature compensation in pharmaceutical water compliance. This Application Note discusses the use of TOC in Clean In Place and cleaning validation technologies. Increasing worldwide demand for vaccines is resulting in manufacturers changing their production methods. Wide model range and standard functionality make this series ideal for basic process and water applications.